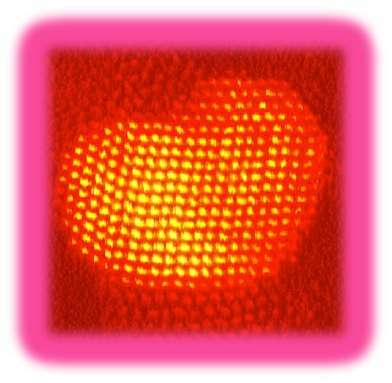 (PhysOrg.com) -- Shattering their own world record from two years ago, scientists from the University of Birmingham in the UK have created the unofficial worlds smallest atomic valentine. Their tiny heart measures approximately 5 nm x 3.5 nm, a significant downsizing of the 8-nm heart from 2010. 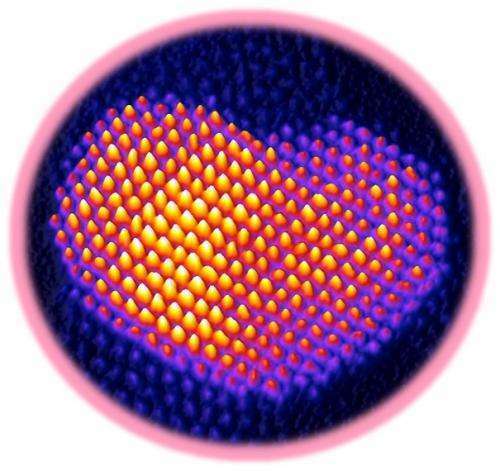 The nanosized valentine is too small to be seen by the human eye or even with an optical microscope since its smaller than a visible wavelength of light. PhD student Alina Bruma, under the supervision of Dr. Ziyou Li, took a few images of the heart last weekend using a JEOL 2100F electron microscope, which uses electrons rather than photons to produce images. The scientists work at the universitys Nanoscale Physics Research Laboratory, which is headed by Prof. Richard Palmer. 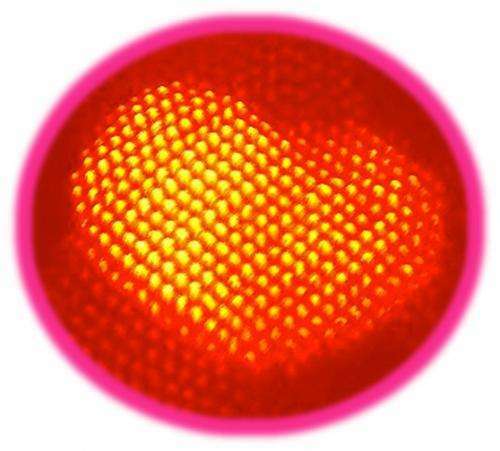 As Li explained, the bumps that make up the heart are made of palladium (Pd) atoms and gold (Au) atoms, which are arranged on an amorphous carbon film. The different colors are false colors produced by imaging software. The key to making the nanoparticles form the heart shape was heating the nanoparticles, which causes a structure transformation. By controlling the annealling temperature and the order of the atoms, the researchers can control how the nanoparticles are chemically arranged. They added that, due to improved control of the heating, this years valentine is also more stable than the one from two years ago. As might be expected, these abilities come in handy for making other things besides tiny hearts. The ability to control the structure of nanoalloys may one day lead to new materials with novel properties, having potential applications in areas such as catalysis and optical devices, Li said. The project is funded by EPSRC (UK) and EU COST Action "Nanoalloy".